How to perform two-staged, bilateral alignment osteotomy with concomitant total knee arthroplasty. Department for Orthopedic Surgery, Lengghalde 2, 8008 Zurich, Switzerland. Schulthess Klinik, Department for Orthopedic Surgery, Lengghalde 2, 8008 Zurich, Switzerland. Introduction: Achondroplasia is the most common form of dwarfism in humans and is orthopedically characterized by shortened extremities and an exaggerated lumbar lordosis. The surgical challenges are maintenance of axial alignment during limb lengthening as well as joint preservation and alignment restoration. Case Report: We present a 46-year-old female suffering from achondroplasia with severe pain in both knees. Severe varus deformities of both femurs and degeneration of both knee joints became apparent on clinical and radiological examination. On each femur, we performed one-staged, lateral closed-wedge osteotomy, and total knee arthroplasty (TKA). Subsequently, the patient was relieved of knee joint pain and gained a greater range of motion. Conclusion: One-staged valgization osteotomy and concomitant TKA represents a challenging, yet reasonable, surgical solution in axially severe malaligned and joint degenerated patients. Keywords: Alignment osteotomy, total knee arthroplasty, achondroplasia. Achondroplasia is the most common form of dwarfism in humans (1 in 10.000 live births) and is caused by a mutation in the fibroblast growth factor receptor 3 (FGFR 3) . Its phenotype is characterized by recurring otitis mediae, an exaggerated lumbar lordosis, a prominent forehead, and a low nasal bridge, a trunk of nearly normal length but shortened limbs. 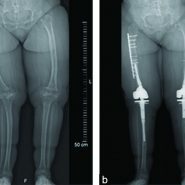 Although there is an abundancy of literature on achondroplasia, little has been reported about the treatment of severe diaphyseal deformities of the femur with associated massive joint degeneration after limb lengthening. 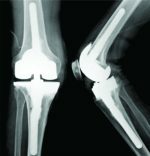 To the best of our knowledge, this is the first reported case of a two-staged, bilateral total knee arthroplasty (TKA) with concomitant femoral extra-articular alignment osteotomy in an adult achondroplasia patient. We report from a 46-year-old female with achondroplasia that presented in our clinic with pain in both knees on weight bearing, and a limited walking distance of 100 m. This pain had started 1.5 years ago and had increased since then, especially on the right side. At presentation, the patient’s weight was 77 kg at the height of 154 cm (body mass index: 32.5 kg/m2). Her medical record included a 7.5 cm limb lengthening of each leg at the age of 12 years using an Ilizarov fixator. 5 years later, her thighs were elongated 14.5 cm using the same method. 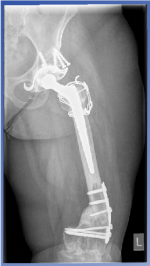 After removal of the Ilizarov fixator, her left femur fractured 8 months later. The fracture was osteosynthesis using a compression plate. 1 year later, the plate had been removed, and an alignment osteotomy of the lower limb as well as a femur traction was performed, resulting in a malalignment. Clinical examination showed a limited range of motion (right knee: Extension/flexion: 0/0/60; left knee: Extension/flexion: 0/5/75; Table 1), massive medial, ligamentous laxity, rotational instability, and pathological anterior-posterior translation. Radiologically, these findings were supplemented by signs of tissue deformation (e.g., subluxation, increased slope) and osteoarthritic features (Fig. 1). For achondroplasia, typical spinal lordosis was not observed in this patient. Furthermore, the clinically obvious malalignments of both legs were radiologically confirmed as femoral axis deformations (Fig. 2a). So far, a difference in leg length of 1.5 cm in favor of the left leg had been compensated by orthotics. Consequently, we performed femoral alignment osteotomy 19 cm proximal (center of rotation of angulation (CORA), through the angulation correction axis ) of the right knee’s joint line with a correction angle of 15° (closed-wedge). Subsequently, the edges were osteo-synthesized using a 12 hole, 4.5 mm LC-plate. In addition, the anterior-medial plateau of the tibia was enlarged by cortical bone of the tibial bone cut, which was fixated with a lag screw. Finally, TKA of the right knee using a rotating hinged implant (NexGen® RHK, Zimmer, Warsaw, IN (Fig. 2 b, e, f)) was completed (Fig. 2 b-d). In a second intervention, a similar procedure was performed in the left knee as well. At first, a femoral alignment osteotomy (valgization, closed-wedge) was made 11 cm proximal (CORA) of the knee’s joint line and osteo-synthesized (11 hole, 4.5 mm LC-plate). On this side, the osteotomy had been within the planned length of the endoprosthesis’ femoral stem. Therefore, we first placed the proximal screws bicortically and fixated the distal part of the plate by reduction forceps. Eventually, the defect of anterior-medial tibial plateau was covered by cortical bone. Subsequently, TKA was performed on the left knee (NexGen RHK, Zimmer, Warsaw IN). The edges of the femoral osteotomy were then cleaned off all cementeous particles and refreshed using chisels. Then, lag screws were placed monocortically at the distal LC – plate into a posterior direction. The small resulting gap of the femoral osteotomy was filled with autologous cancellous bone. Post-operatively the patient was mobilized – for both sides identically – with partial weight bearing using forearm crutches, trained by continuous passive motion (Kinetec), and physiotherapy for 8 weeks. Anticoagulation was continued during this time. On discharge from hospital 13 days after surgery, the patient was free of pain and showed normal, dry wounds. Clinically there were no complications or complaints in the following 12 months of follow-up. Radiologically, no signs of prosthetic loosing or wear-out were observed which is in accordance with correctly balanced alignment. Achondroplasia is caused by a well-investigated dysfunction of the FGFR3 and is strongly associated to the previously described, typical phenotype. Impaired extremity’s growth is preferably treated by Ilizarov’s technique, which yields considerable complications such as malalignments [3, 4, 5]. So far, little has been reported on the treatment of those long-term complications (here, severe limb axis malalignment and joint degeneration) and their treatment in patients of progressed age. Therefore, the described case is noteworthy as it: First reports for the first time a “typical” achondroplasia patient that is treated bilaterally by concomitant TKA and femoral, extra-articular closed-wedge osteotomy and second describes a surgical technique, which can be used for the treatment of different pathologies with similar phenotypes . Due to the stronger pain and discomfort, we decided to treat the right side first. On clinical examination, a severe, medial contraction of the soft tissue and lateral laxity became evident. Considering the femoral deformity as well as the massive joint degeneration, TKA without alignment osteotomy or vice versa was considered to yield unsatisfactory outcomes . Although large deformities distant to the knee have little impact on the knee, they may reduce overall survival of knee endoprosthesis’ if not corrected . Varus deformities require lateral intra-articular over resection, which produces lateral instability and would have enhanced laxity in this case . Given the ligamentous laxity, usage of a hinged implant was without alternative. 7 months later and without complications occurring on the right side, we repeated this procedure on the left side. Here, the surgical challenge was the placement of the cemented femoral stem through the fresh osteotomy without breaking the osteosynthesis apart or tilting the stem. We therefore used the test stem as a reference for a low-resistance intramedullary insertion and corrected the position of the osteosynthesis slightly. To avoid malrotation, we marked the corresponding parts of the osteotomy previously using a cauterizer. Screws of the LC-plate were placed in a monocortical manner to avoid interference with the endoprosthesis’ femoral stem. Another challenge was to keep the osteotomy’s edges free of cement to guarantee secondary osteosynthesis. Therefore, after insertion of the cemented femoral stem, the edges were refreshed by using chisels. As achondroplasia-patients tend to have small bones we recommend preoperative planning to evaluate whether standard endoprostheses are sufficient or if customized/micro products are necessary. Here, the mediolateral distance of the condyles as well as the anterior-posterior distance of those is essential for the reestablishment of the proper anatomic dimensions. Tibial augmentation represents a plausible alternative to osseous reconstruction to accommodate for bony defects and to achieve a sufficient tibial contact surface . It has been reported by Brooks et al. that patients with achondroplasia tend to have a more anterior tibial slope than non-achondroplasia patients, leading to a genu recurvatum, which has to be acknowledged when planning the operation . To improve patellar tracking, additional lateral retinacular release may be considered. One shortcoming of this study is the relatively short follow-up of our patient. However, several months after operation there were no complications or complaints reported, and the patient returned full-time to her working place. Finally, the technical considerations discussed in this case report provide important points to be considered when operating patients undergoing TKA and concomitant osteotomy. Combined, one-stage alignment osteotomy and TKA represents a surgically challenging – yet reasonable – treatment option to achieve pain relief, a wider range of motion as well as greater stability. Severe diaphyseal malalignments require additional extra-articular correction as intra-articular osteotomy cannot compensate for a complete correction. 1. 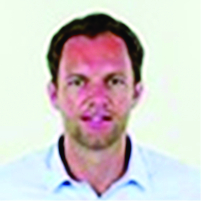 Ornitz DM, Legeai-Mallet L. Achondroplasia: Development, pathogenesis, and therapy. Dev Dyn 2017;246(2):291-309.1. 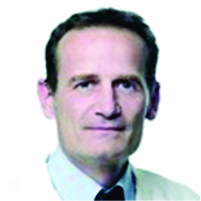 Ornitz DM, Legeai-Mallet L. Achondroplasia: Development, pathogenesis, and therapy. Dev Dyn 2017;246(2):291-309. 2. Correll J. Achondroplasia and hypochondroplasia in paediatric orthopaedics. Orthopade 2008;37(1):40-48. 3. Pejin Z. Femoral lengthening in children and adolescents. Orthop Traumatol Surg Res 2017;103(1):S143-S149. 4. Rohilla R, Wadhwani J, Devgan A, Singh R, Khanna M. Prospective randomised comparison of ring versus rail fixator in infected gap nonunion of tibia treated with distraction osteogenesis. Bone Joint J 2016;98-B(10):1399-1405. 5. 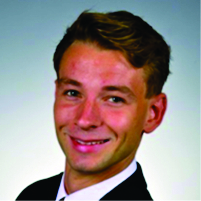 Repo JP, Barner-Rasmussen I, Roine RP, Sintonen H, Tukiainen EJ. Treatment of compound tibia fracture with microvascular latissimus dorsi flap and the Ilizarov technique: A cross-sectional study of long-term outcomes. J Plast Reconstr Aesthet Surg 2016;69(4):524-532. 6. Tetsworth K, Paley D. Malalignment and degenerative arthropathy. Orthop Clin North Am 1994;25(3):367-377. 7. Wolff AM, Hungerford DS, Pepe CL. The effect of extraarticular varus and valgus deformity on total knee arthroplasty. Clin Orthop Relat Res 1991;271:35-51. 8. Marcovigi A, Zambianchi F, Giorgini A, Digennaro V, Catani F. The impact of bone deformity on osteoarthritic varus knee correctability. J Arthroplasty 2016;31(12):2677-2684. 9. Hungerford DS. Extra-articular deformity is always correctable intra-articularly: To the contrary. Orthopedics. 2009;32. pii: orthosupersite.com/view.asp?rID=42844. 10. Ritter MA, Harty LD. Medial screws and cement: A possible mechanical augmentation in total knee arthroplasty. J Arthroplasty 2004;19(5):587-589. 11. Brooks JT, Bernholt DL, Tran KV, Ain MC. The tibial slope in patients with achondroplasia: Its characterization and possible role in genu recurvatum development. J Pediatr Orthop 2016;36(4):349-354. 12. Insall JN, Dorr LD, Scott RD, Scott WN. Rationale of the knee society clinical rating system. Clin Orthop Relat Res 1989;248:13-14. 13. Melhem E, Assi A, El Rachkidi R, Ghanem I. EOS(®) biplanar X-ray imaging: Concept, developments, benefits, and limitations. J Child Orthop 2016;10(1):1-14.